Bonus Offer: You will receive a free Weiss Schwarz Re: Zero - Starting Life in Another World play mat with every 4 boxes of boosters pre-ordered! With the Weiss Schwarz: RE: Zero - Starting Life in Another World set, you can relive scenes such Puck's rampage, battling the cultists, Rem's awakening, the White Whale Hunt, and more!! 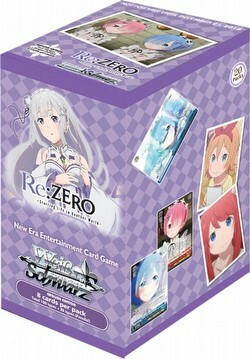 The set includes multiple cards that strengthen the prowess of cards released in the Re: Zero Trial Deck. Look for signed cards from the voice cast - Yusuke Kobayashi (Suburu), Rie Takahashi (Emilia), Chinatsu Akasaki (Felt), Inori Minase (Rem), Rie Murakawa (Ram), and Satomi Arai (Beatrice). One of five different promo cards is included in each booster box. The cards in this set may be used with cards whose numbers begin with RZ/. There are 100 cards in the set plus 22 Parallels. Each box includes 20 packs. Each pack contains 8 cards.